For a nothing less than incredibly stylish ensemble, reach for a burgundy overcoat and J.W.Anderson double pleat pinstripe wool trousers. If you don't want to go all out formal, throw in a pair of white leather brogues. 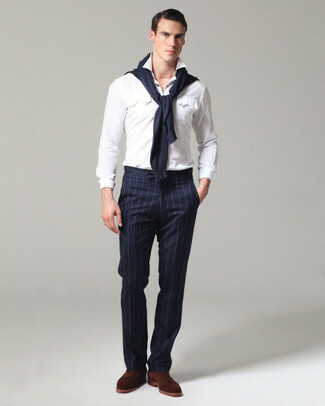 For a nothing less than incredibly stylish getup, choose a light blue dress shirt and J.W.Anderson double pleat pinstripe wool trousers from MATCHESFASHION.COM. 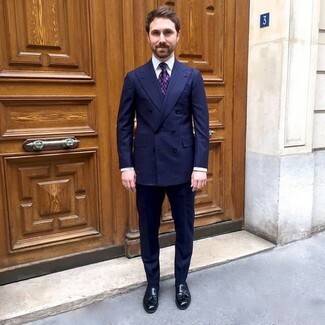 For a casually elegant outfit, make a blue denim jacket and J.W.Anderson double pleat pinstripe wool trousers your outfit choice — these two items play really good together. Black suede derby shoes are a wonderful choice to complement the look. 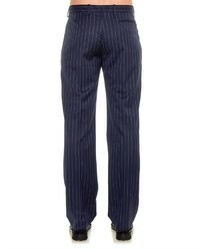 For a casually elegant getup, pair a grey parka with J.W.Anderson double pleat pinstripe wool trousers from MATCHESFASHION.COM — these items go really well together. 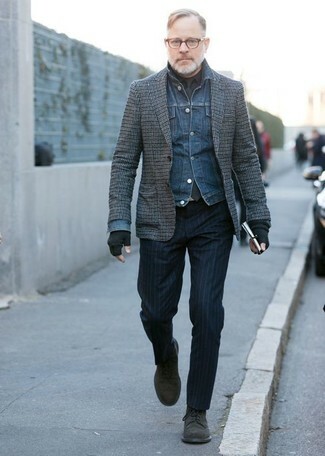 Contrary to what you might believe, getuping seriously stylish doesn't require that much effort. 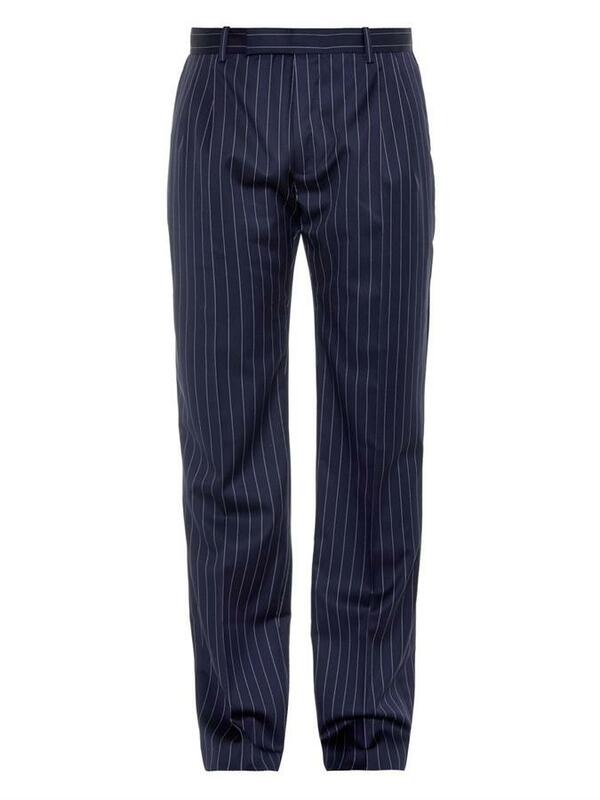 Just try pairing a navy crew-neck sweater with J.W.Anderson double pleat pinstripe wool trousers from MATCHESFASHION.COM and you'll look incredibly stylish. 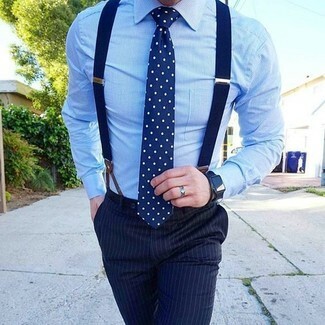 You could perhaps get a little creative when it comes to footwear and dress up your getup with dark brown suede oxford shoes. 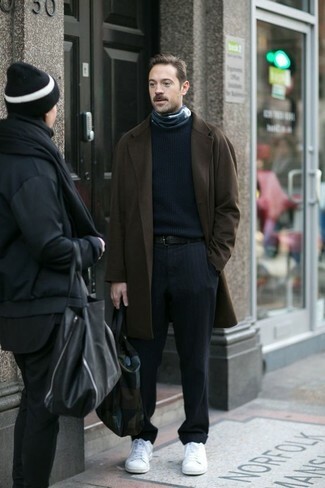 Try teaming a dark brown overcoat with J.W.Anderson double pleat pinstripe wool trousers from MATCHESFASHION.COM like a true gent. Want to go easy on the shoe front? Opt for a pair of white low top sneakers for the day. 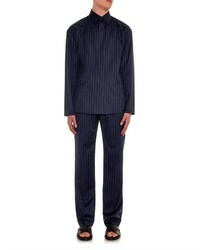 Dress in a navy vertical striped double breasted blazer and J.W.Anderson double pleat pinstripe wool trousers from MATCHESFASHION.COM for a classic and refined silhouette. Go for a pair of black leather tassel loafers to have some fun with things. 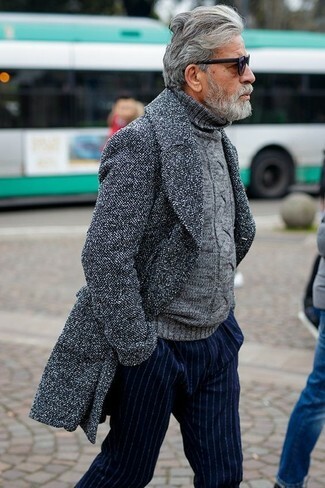 Consider teaming a grey overcoat with navy vertical striped dress pants for a sharp, fashionable look. 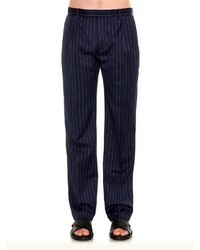 A navy vertical striped double breasted blazer looks especially refined when paired with J.W.Anderson Double Pleat Pinstripe Wool Trousers for a look worthy of a stylish dandy. Let your sartorial credentials really shine by finishing your outfit with a pair of black suede tassel loafers.